Recently I was chatting with a neighbor upon her arrival home from a nearby garage sale and she was showing me the cute clothes that she had found for her 5-year-old son. As she laid out the brand name jeans and shirts, I thought two things: One, that she had found some great deals, of which I'm always a fan. And two, that Big Sister E would love some of the "boy" shirts that she was pulling out - the ones with trucks and construction equipment and superheroes. After all, she is the girl that can alternate between walking around in high heels and a tutu and only wanting to dig in the dirt and wear dark blue. As well as hopping in the car to get over to that sale, I know that I can also get a happy result by having the girls' much-loved Bob the Builder around... and with the new release of Bob the Builder: Super Scrambler, that has been proven once again. There's no challenge too great for this hard-hat wearing, hard-working builder and his Can-Do crew and, available today (August 16, 2011) on DVD, Digital Download and On Demand from Lionsgate and HIT Entertainment, Bob the Builder: Super Scrambler is another collection of super-sized adventures that any young fan will enjoy. 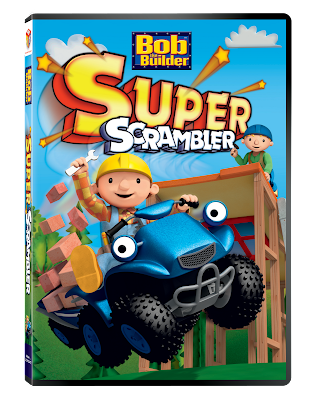 The four exciting adventures on this DVD follow along when Scrambler wants to be a Super-Smasher hero while he builds Farmer Pickles’ milk shed and works alongside the whole Can-Do crew to get the job done. As usual, Wendy, Travis and Muck show the team there’s more to strength than lifting heavy blocks and that following instructions is always important. Of course Bob and his crew finish the job with the super power of tools and teamwork! 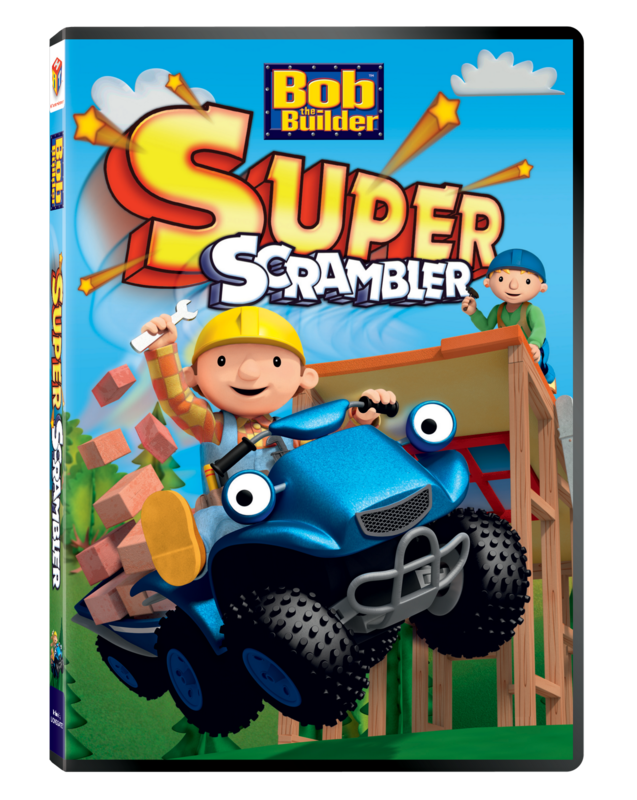 Aimed at ages 2 - 5, Bob the Builder: Super Scrambler has a running time of 44 minutes (64 minutes including the special features) and retails around $8.99 - $9.98. 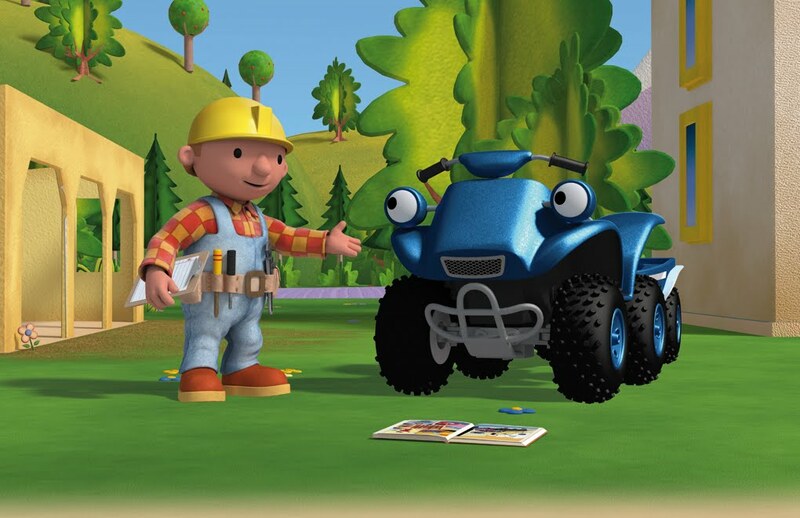 We always love seeing the way that these tales can demonstrate that with the super power of tools, teamwork and lots of fun, Bob, Scrambler, Scratch, Roley, Wendy and the rest of the Can-Do Crew can eagerly take on and complete any job with a positive approach (remember, the Fun Is In Getting It Done)! To enter to win: Tell me the name of your child's favorite television or movie character. 1 Extra Entry (per method) if you follow Bob the Builder on Twitter and/or Like them on Facebook. Giveaway will end on September 6th at 11:59pm CST. Do me the favor of leaving an email address or making absolutely sure it is visible in your profile, I have to have a way to contact the winner. The winner will be chosen by random.org and announced here as well as emailed and will have 48 hours to contact me or respond to notification or a new winner will be chosen. This giveaway is open to U.S. residents only. 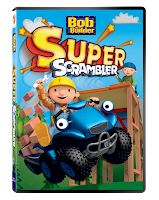 A big thank you to Lionsgate and HIT Entertainment for providing a copy of Bob The Builder: Super Scrambler for me to review as well as for one lucky giveaway winner. The opinions shared are my own and honest and if you really need to see more, click here to see how I roll. Grandson is totally fascinated with Dora. Thanks for the wonderful giveaway. Right now my boys are into Superman, Spiderman and Batman! My son loves Bob! He also loves everyone from Super WHY and Elmo! I like Bob the Builder on FB! I totally depends on the day, some times its bob the builder, or spongebob, or spiderman, or strawberry shortcake! My nephews favorite is Chuggington. I follow you on Facebook, and bob the builder!!! My sons favorite cartoon is MickeyMouse Clubhouse, he gets up and dances and sings it's so cute! My son loves Mickey Mouse Club house. Especially when they do the hotdog song! Lol it so funny cause he's 3 and trys to dance and sing along!! We don't actually have any Television channels where we live (the middle of no where.. no cable, no satellite reception etc), but my son has watched some shows on DVD. He really likes Chuck the Truck! I think Micky and Minnie...Mickey's ClubHouse might be the favorites. My kids like Fireman Sam. Thanks. My son loves Thomas and all the other train characters. My son loves Bob & Mickey & Sid the Science kid. Entered the ultimate Green store. My child's favorite tv show is Thomas and friends, and Bill and Ben are his favorite characters on the show.